This half-hour comedy focuses on the bizarre experiences of fresh-faced medical intern John "J.D." Dorian (Zach Braff) as he embarks on his healing career in a surreal hospital crammed full of unpredictable staffers and patients where humor and tragedy can merge paths at any time. Joining the rumpled J.D. in his exhilarating brave new world are his college buddy, Chris Turk (Donald Faison, "Clueless"), an intern with a more elite surgical group, and J.D. 's fellow medical intern, the beautiful and driven Elliot Reid (Sarah Chalke, "Roseanne"). Keeping the new interns on their toes are: the fatherly chief of medicine, Dr. Bob Kelso (Ken Jenkins); the abrasive, worldly Dr. Perry Cox (John McGinley), and the caring but slightly jaded nurse Carla Espinosa (Judy Reyes). The hospital janitor (Neil Flynn) also never seems to miss an opportunity to harass his target. Love this show & characters... It’s rare to have a sitcom with characters that are dynamic, to grow and change...But it’s a valid sit-com silly slap-stick stuff, yet refined in delivery. 5.0 out of 5 starsThe best! Scrubs was the best newest sitcom around. I doubt anything will top it. If you love silly and slapstick combined with heartfelt drama in each episode with reflective life evaluations - this is the show for you. As for the DVDs, I bought them individually (Seasons 1-8. For non-Scrubs viewers, the show finished at season 8. Season 9 is technically a spin-off with medical students and only some of the original cast). I didn't want to buy the full box set once I saw that the DVDs were in the slide-in cardboard sleeves on pages of a book. While it's a very cute idea, who wants to touch the bottom of their dvd's to get it out? So I bought each complete season individually and it was a lot cheaper. Each season has great bonus features - a lot of interviews and behind the scenes and bloopers and alt lines, etc. So happy I finally have the entire series in my collection! I started watching scrubs after my heart attack then it made me feel good about my doctor visits and made me feel good about my medical health. Looks like an old friend from the past and keeps me on the healthy path. Lots of laughs lots of fun I enjoy this series. I really wish that I had gotten into this show years ago. I didn't even see an episode until I bought this set, which came out just after the end of the fourth season. Yes, I try not to do "blind buys", but this set came very highly reccomended, and I really enjoy the other material by Zach Braff and Bill Lawrence. The show centers around Dr. John "J.D." Dorian (Braff), a medical intern at Sacred Heart Hospital, which is probably one of the craziest hospitals on Earth. Along with his best friend Chris Turk (Donald Faison), a surgical intern, and Elliot Reid (Sarah Chalke), another medical intern, J.D. tries to make it through the days while having to deal with bizarre patients, nasty superiors, and an insane janitor (Neil Flynn) who can't seem to leave J.D. alone. Other cast-members include Nurse Carla Espinosa (Judy Reyes), who begins a relationship with Turk, Todd Quinlan (Robert Maschio), another surgical intern who becomes a friend of Turk's, and Ted the Lawyer (Sam Lloyd), a pathetic man who is constantly afraid of malpractice suits. Then there are the doctors. Dr. Perry Cox (John C. McGinley) is a self-hating cynic who, while appearing to be mean to J.D. and the other interns, really only wants them to succeed, and all of his criticism is (fairly) constructive. On the other hand is the evil Dr. Bob Kelso (Ken Jenkins). Kelso is a man who cares more about the money than the patients (as opposed to Cox, who hates the fact that medicine is now a "business"), and he looks for things that the interns do to criticize. This show has a very wacky kind of humor; utilizing sound effects, cutaways, and metaphors for jokes, almost anything is fair game. It may take a few minutes to get used to, but this is definitely one of the funniest shows that I've ever seen. The show makes good use of metaphors; sometimes when a character is speaking metaphorically, we see a cutaway scene showing the metaphor literally (like when J.D. compared the hospital to high school- medical interns are the geeks, surgical interns are the jocks, and nurses are the cheerleaders). Other times, when a character is speaking literally, we see a metaphorical cut scene. When I first heard about this show, I was unsure as to how the writers could successfully pull off a comedic medical show. I mean, there is a lot to make fun of, but things can easily be carried too far, especially when dealing with death. Fortunately, the writers and actors know when to switch from being comedic to being dramatic, and it gives the show a sense of dignity that many other shows do not have. In the extras department, we get some pretty good stuff. Deleted scenes that are actually funny (I like the one involving two patients who are mentally insane, and believe themselves to be Jesus and Satan), good outtakes, alternate line readings, and audio commentaries. In conclusion, this is a great boxed set. It is a definite must-own for Scrubs fans, and is worth checking out for someone who's never seen the show. and keeps going throughout the whole season with 24 episodes and various special features-deleted scenes, bloopers, favorite moments and what not. All the actors in this first season of Scrubs are on their A games as if they've been working together for years. You can feel the chemistry already between the different actors/actresses throughout. With many laughs, good times and few bad ones for each. They still come through this first season a bit stronger and better off then when they started. 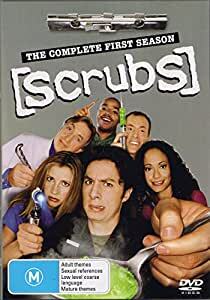 It goes without saying that the first season of Scrubs is a complete smash hit and with so many laughs throughout it. You will hard pressed to not laugh at less once an episode if not more with added guest stars like John Ritter (playing JD's father) and others. Great start off point to get acquainted with an well put together and well writter series in Scrubs.